Part I of my review, Getting It Into The House, can be found here. I have never been one to be overly excited about 'unboxing' information. But given the struggle to get this wide format printer into the house there is something to be said for assessing the packing material. In my mind probably the most important part of this involves how the printer is situated relative to the wooden shipping palette itself. In this case, the bottom of the wooden palette actually only has a very thin piece of cardboard covering it BUT there are two large pieces of Styrofoam that lift the printer off the surface of the wood and appear to provide good protection from palette damage. The top and sides of the printer are also well protected with Styrofoam, which has cutouts at the top to hold the supplied ink cartridges (starter cartridges only.....just like Epson....nobody wants to give the consumer a break! ), printhead, and parts for the printer's stand. Once the machine is unpacked and the stand assembled the next challenge is getting the printer to where you want to keep it. One no longer has to worry about a 300 pound palette. The printer itself weighs 'only' 185 pounds. Not too bad. However, it is VERY bulky and you have to be careful to lift it only from certain areas that can support the weight. There are very nice built in 'handle grips'. Two strong people can lift it, but more would be preferable. But where to put it? Unless your home 'studio' or office is on the first level of your home, the machine is going to have to go up or down stairs. My situation was a real challenge. In the city where I live the homes can be very old and have a fairly unique architecture that is common in the region. My house is well over 100 years old and my 'studio' is on the third floor. Homes of this age are typically built with third floors! And worse, while the stairway to the second floor is normal in size, the stairway from second to third floor is extremely narrow and makes a 360 degree turn!. 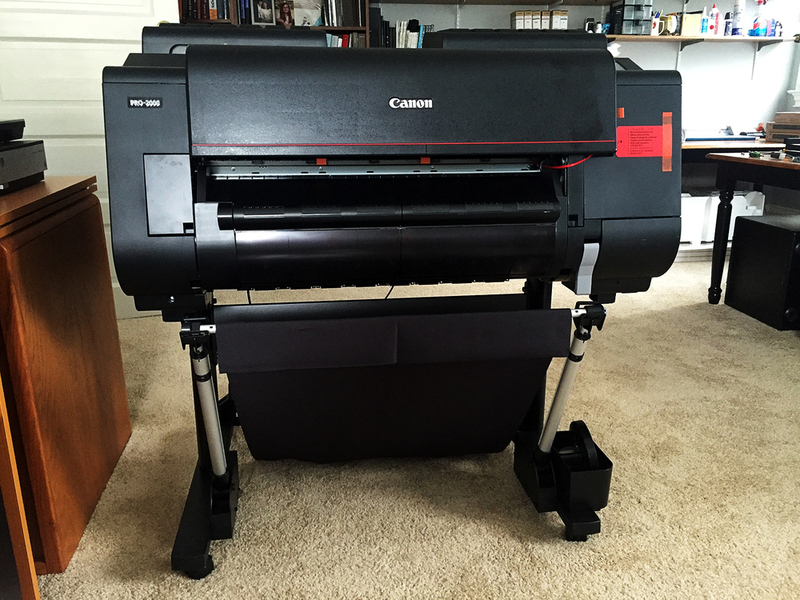 My Epson 7900 required professional movers to get the machine up to the third floor and I took the same approach with the Canon. It was NOT easy, but it was accomplished, though the machine did have to be turned on its side to traverse the 360 degree hairpin turn. Plan for the difficulty of moving the machine once unboxed! In order to provide some information that I would have found very helpful, but was unable to locate on-line, I am going to give the maximal measurement for each of the machines dimensions (in inches) OFF the stand. The Canon website seems to insist on including the stand. The length is 43 3/4 inches , the depth (front to back) is 28 1/4 inches, and the height (top to bottom) is 25 inches. This information may be useful if you are trying to figure out if the printer will fit through a door or up a stairwell. The stand is no problem as it comes unassembled. So what about the build, particularly as compared to my old Epson 7900? The entire machine is structured very differently from the Epson printer. The ink tanks, paper roll holder, and paper feed are all in different locations. Once I get the machine going and get facile in its use I will be able to tell if I feel the arrangement is any better, worse, or the same. However, the Canon, to me, does feel somewhat 'flimsier' or more 'plasticy' than the Epson. Of course, this also contributes to its being a bit lighter, which is very helpful in terms of moving the machine to where it needs to be. Other than for protection while moving I doubt that the difference in build is likely to be meaningful in everyday usage. The printer stand is solidly built and easy to assemble. There are two items which I feel are missing and should have been supplied. First, no USB cable for connecting to the computer.....really?? And how about a printed manual. There is a small printed pamphlet on loading up the inks, inserting the printhead, and starting and calibrating the printer. But beyond that you are referred to the on-line manual. I do think that for a device as sophisticated as this, enclosing a printed manual (Epson does) is really scrimping in a foolish way. Coming in August......firing up the printer, ease of use, and subjective print quality!